Palestinian Authority chairman Mahmoud Abbas declares his willingness to meet with Israeli PM, if meeting is organized by President Trump. Palestinian Authority chief Mahmoud Abbas indicated he was willing to meet with Prime Minister Binyamin Netanyahu, if the meeting was under the “auspices” of President Donald Trump. Speaking to reporters in Ramallah Tuesday, Abbas said President Trump was expected to visit Palestinian Authority leaders in Judea and Samaria “soon” – referring to an upcoming trip to Israel scheduled for May 22nd and 23rd. 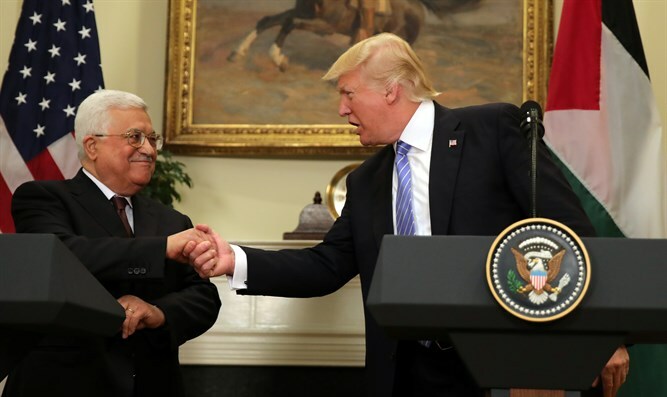 While President Trump had planned to visit Abbas at his residence in Ramallah, Abbas indicated the president would also be heading to Bethlehem during his trip. "We are looking forward to his visit soon to Bethlehem," said Abbas. The PA leader said he was ready to meet with Israel’s Prime Minister if President Trump were to organize a meeting between the two leaders.